The Best Property Law blogs from thousands of top Property blogs in our index using search and social metrics. Data will be refreshed once a week. UK and Dubai About Blog Commercial Property Law blog from the team at Gateley Plc.Our strategy is to differentiate ourselves, incentivise our people to retain and attract the best talent in the industry and become a law-led business services group through diversification. Facebook fans n/a. Twitter followers 2,866. UK, US & Beyond About Blog Property Blawg is a property law & conveyancing news blog by property lawyers & professionals. About Blog Gravel2Gravel, a Pillsbury blog, brings you breaking news and analysis on business and legal issues affecting the construction and real estate industries. Facebook fans n/a. Twitter followers 3,227. About Blog Property Insurance Coverage Law Blog is written by the attorneys of Merlin Law Group and provides insights on Insurance and Policy for property owners. Cambridge, MA About Blog Find updates on property laws on this blog. Facebook fans 5,145,684. Twitter followers 784,184. About Blog Find the latest updates related to property law on this blog. Greater Boston, MA About Blog The Leading Resource on Massachusetts Real Estate Law by Richard D. Vetstein. It is the Highest Trafficked Real Estate Law Blog In The United States. Facebook fans n/a. Twitter followers 1,985. Somerville, MA About Blog The Sherwin Law Firm provides legal representation for foreclosure defense, landlord-tenant, and property/land use matters in Boston and the Greater Boston Region and also provides representation that is convenient, affordable, and aimed at getting you the results you need. Facebook fans 80. Twitter followers 191. About Blog Olshan Real Estate Law Blog is one of the leading mid-size firms in the nation. Find latest updates on property and real estate laws. Sacramento, California About Blog Real Estate & Business law Attorney in California for over 30 years, advises business and individual clients in real estate and business deals & litigation. Facebook fans 67. Twitter followers 81. Weston, FL About Blog Oppenheim Law's practice areas include real estate, commercial litigation, corporate and business related matters. Facebook fans 5,440. Twitter followers 2,146. Toronto, Ontario About Blog The Mills & Mills Toronto Law Blog regularly posts articles on legal matters involving business, estate, real estate, family, employment and litigation. Facebook fans 152. Twitter followers 208. New York About Blog Himmelstein McConnell Gribben Donoghue & Joseph specializes in real estate litigation and transactions and provides representation to tenants, shareholders and condo unit owners in commercial and residential landlord-tenant matters and Loft Law proceedings. Facebook fans 2,535. Twitter followers 57. New York, NY About Blog This Landlord/Tenant Law blog by McAdams Law offers information and commentary related to property and real estate law. Facebook fans 32. Twitter followers 20. Queensland, Australia About Blog Property Law Today is Australia's #1 Property Law Blog including Property Development, Residential, Commercial, Conveyancing and more. Facebook fans 581. Twitter followers 477. Miami, Florida About Blog Description - Jordan Pascale, P.L. represents clients in real estate cases in the greater Miami area. The firm's litigation practice handles a variety of legal matters. Facebook fans 198. Twitter followers 13. Brighton | Eastbourne About Blog Find updates on Property law blogs, Construction law blogs Business and Employment law blogs. Facebook fans 508. Twitter followers 970. San Francisco About Blog The Sack Rosendin, LLP blog shares Real Estate Law stories and opinions relevant to Oakland, California residents. Minneapolis, Minnesota About Blog This Business & Real Estate Law blog discusses legal issues relevant to Minneapolis, Minnesota. At Burns & Hansen, PA, we look forward to hearing from you. Facebook fans 77. Twitter followers 15. Edmonton, Alberta About Blog A law blog for regular people, making Alberta real estate easy. Have the Investor Lawyer on your side! Buy and sell houses with a veteran lawyer, investor, and teacher. Facebook fans 602. Twitter followers 2,028. About Blog This blog by Mehalko and Moghul PLLC discusses legal information on the topic of Real Estate And Business Law for McLean, Virginia residents. Los Angeles, CA About Blog The Goodkin & Lynch, LLP blog shares Real Estate stories and opinions relevant to Los Angeles residents. About Blog The Real Estate Attorneys with the Law Offices of Peter N. Brewer answer the common, and not-so-common real estate law questions and comment on current issues impacting California Real Estate Law. Australia About Blog Robert Hay is the author of this blog.He is a barrister who practices in the area of Property and Commercial law. Thailand About Blog Leading international law firm in Thailand. Lawyers, Attorneys & Arbitrators specializing in corporate,arbitration, real estate,tax law, plus business registration, litigation, and general legal services. Facebook fans 878. Twitter followers 602. Los Angeles About Blog Real estate law blog for DiJulio Law Group in Los Angeles.DLG is a medium sized law firm specializing in real estate law, construction law and immigration. About Blog This blog provides Philadelphia residents with information on Real Estate Law from Avallone Law Associates. San Antonio, TX About Blog The Matthew J. Obermeier blog shares real estate law stories and opinions relevant to San Antonio, Texas residents. Facebook fans 434. Twitter followers 22. About Blog This Camden, Delaware blog by Law Offices of Bonnie M. Benson, P.A. discusses legal issues related to Real Estate Law. Dania Beach, FL About Blog We are a specialized firm providing counsel in all areas of Short Sale, Landlord- Tenant Issues,Quiet Title, Real Estate Closings, and more. About Blog The Vinsko & Associates, P.C. blog seeks to inform Wilkes Barre residents of current events and legal information about Real Estate law and family law. New York, NY About Blog This blog by Turek Roth Grossman LLP, Attorneys at Law aims to bring news and commentary on Real Estate Law issues to residents of New York, New York. About Blog The Law Office of Tom Murphy blog seeks to inform Austin, Texas residents of current events and legal information about Construction And Real Estate Law. About Blog Find updates on Business And Real Estate Law Blog on this site. Canada About Blog Lawson Lundell LLP is a leading western Canadian business law firm with offices in Vancouver, Calgary, Yellowknife and Kelowna.Find real estate law updates on this blog. Facebook fans n/a. Twitter followers 1,654. Campbell, CA About Blog This blog provides San Jose, California residents with information on Real Estate from The Stone-Siegel Law Firm. Bronx, NY About Blog This Real Estate blog offers news and other information Law Office of Phil Napolitano hopes Bronx, New York residents will find helpful. Facebook fans 290. Twitter followers 159. Melbourne, FL About Blog Our law firm, Frese Whitehead offers this Business & Real Estate Law blog for residents of Melbourne, Florida. London About Blog Property Matters is a property law blog from real estate lawyers at national law firm Mills & Reeve. Regular updates and commentary on the latest legal news in real estate. Oakland and Castro Valley, CA About Blog PLP attorney law firm specializes in small business, Real Estate and collection cases. Over 45 years, serving the San Francisco, Oakland, Pleasanton Bay Area. Facebook fans 100. Twitter followers 153. Overland Park, KS, USA About Blog Informational guides and other posts on issues related to Real Estate Law and Real Estate law issues for Kansas and Missouri. Facebook fans 251. Twitter followers 1,020. About Blog Weissman connects the pieces, people, and places of the real estate experience helping communities, businesses and individuals navigate the complex legal issues in the world of real estate. Somerset, New Jersey About Blog Mariano & Coiro, P.C., has been providing advice, representation and legal services to people in central New Jersey. Facebook fans 113. Twitter followers 142. Vancouver, BC, Canada About Blog We share noteworthy BC real estate industry updates to help you make the most of your home and real estate investment. You can also find us on social media. Facebook fans 94. Twitter followers 180. Davie, FL About Blog The Sobi Law Group, P.L. blog shares Real Estate Law stories and opinions relevant to Davie, Florida residents. Facebook fans 157. Twitter followers 3. West Palm Beach, FL About Blog James N Brown, P.A is a real estate law attorney in west palm beach, specializing in real estate law, title services, foreclosure, short sales, and contract litigation. Facebook fans 107. Twitter followers 9. About Blog Our Georgetown, Delaware blog offers news and insight on issues of Real Estate Law. Tunnell & Raysor, P.A. welcomes your comments. Facebook fans 477. Twitter followers n/a. About Blog The Hanson Law Firm blog seeks to inform San Francisco, California residents of current events and legal information about Real Estate Law. About Blog This Calgary, Alberta blog by Lintott Law discusses legal issues related to Real Estate. Brookfield, WI About Blog With over 20 years of law experience and 16 years as a real estate investor, Amy Farrow is a trusted legal resource.Find real estate law updates on this blog. Camarillo, CA About Blog The The Law Offices of William S. Dunlevy blog seeks to inform Camarillo, California residents of current events and legal information about Estate Law. We welcome your commentary. About Blog This blog provides Orlando, Florida residents with information on Real Estate Law from Property Rights Law Firm, P.A. About Blog Find updates on property and real estate laws on this blog. Australia About Blog William Stark is a property barrister at the Victorian Bar. This blog is exclusively on discussing various property laws. About Blog Scott C. Gherman, P.A. is a full-service law firm dedicated to real estate, title insurance, foreclosures, commercial litigation matters and more. 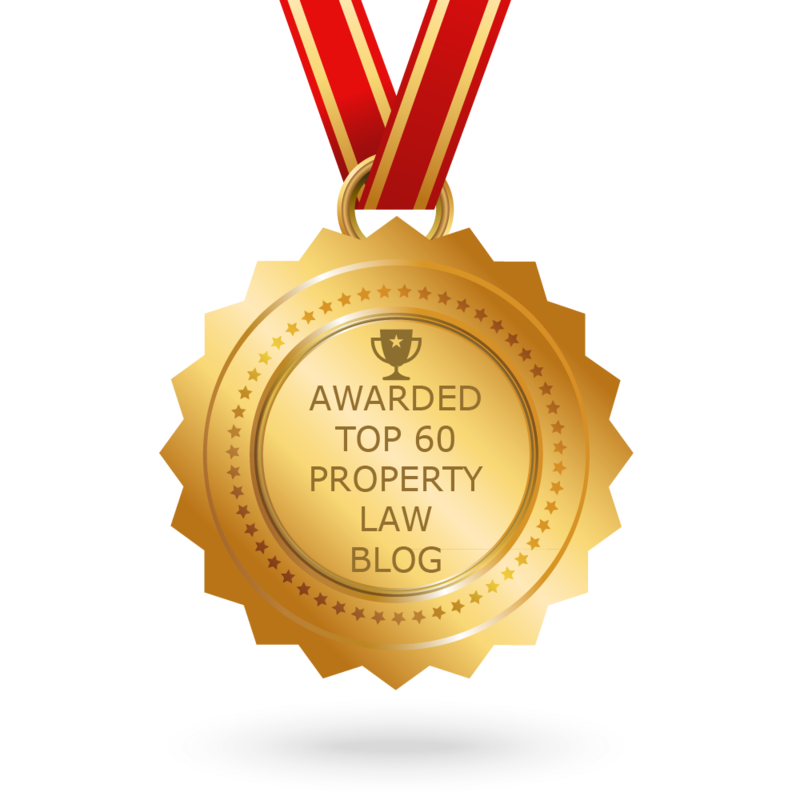 CONGRATULATIONS to every blogger that has made this Top Property Law Blogs list! This is the most comprehensive list of best Property Law blogs on the internet and I’m honoured to have you as part of this! I personally give you a high-five and want to thank you for your contribution to this world.